Dawuni was appointed as one of the Initiative’s Ambassadors last year, joining Academy Award winning actor Julia Roberts, and chef Jose Andres as global champions. An estimated 4 million people die annually as a result of exposure to smoke from open flames, with a majority being women and children – spurring his commitment to helping raise awareness of this issue. 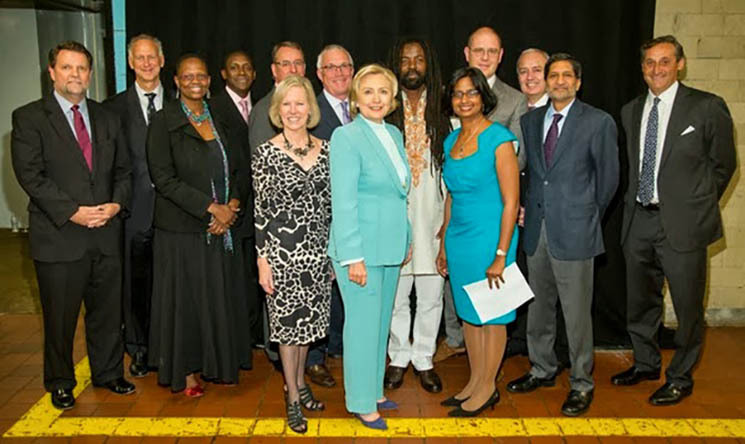 Dawuni also met with the Chief Executive of the Global Alliance, Radha Murthiah, President of Guatemala, Otto Perez Molina, former president of Ireland, Mary Robinson and CEO of UN Foundation, Cathy Calvin and other distinguished members of the Alliance’s Leadership Council at the George Soros Foundation. On the musical front, Rocky Dawuni performed at Playing for Change Day’s annual fundraiser just prior to leaving for NYC, alongside blues legend, Keb Mo, John Densmore of The Doors and Playing for Change Band. The event, held at the World Famous Whisky A Go Go in Hollywood, CA helps raise funds for the building of music schools around the world. He also hosted the debut Beach Ball Festival at Santa Monica Pier in Santa Monica, CA, where fans enjoyed performances by Michael Rose, Sly & Robbie, U-Roy and other Reggae greats – a fun, new experience and a departure from closing out Levitt Pavilion MacArthur Park’s summer concert season with a sizzling headlining show earlier in August. Dawuni began the summer with a two-part European tour, which stopped at the top Reggae, World and Jazz music festivals and garnered excellent reviews.